A baby kougra came frisking around the stone wall of their neohome, nearly bowling down his owner, Julleigh. She jumped out of the way with a yelp, and the poor little infant went skidding across the floor, stopping suddenly at the opposite wall with a soft thwump! His face was contorted in a saddened grimace, and his furry cheeks were stained with tears. Julleigh walked over and crouched down next to her tiny neopet, who had now begun to sob. “Madacargas, what on Neopia has happened?” she cooed, bundling him up into her arms and holding him close. His thin whiskers quivered and tickled Julleigh’s neck. He sniffled pitifully and looked up at her, dark eyes overflowing, bottom lip wobbling. Epiffany was a young, bouncy Eizzil. She was soft, squashy, podgy, and round, with newly sewn stitches connecting her plushie hems and holding her together. 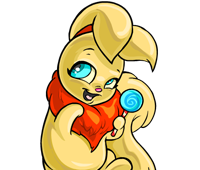 This wily wabbit was forever getting out of Madacargas’s room and causing havoc on Fruity Path. Today, Julleigh had forgotten to shut the screen door after finishing her work in one of her two lushes gardens, and Epiffany had squeezed effortlessly through the crack. Now, she was out in the blackberry patch, nibbling on the bushes. She was accompanied by her Lightmite, Doily, who had no idea what was happening, but was obliged to follow his companion. He carelessly occupied himself in catching and eating Moquots while his Eizzil was causing a ruckus. Epiffany looked up suddenly, very conscious and alert. Something was stirring inside the house… News must have gotten out of her escape, and Madacargas would soon be out looking for her. If she didn’t hurry away quickly, she would not have a chance to knock over some flower pots in the Algonquin’s garden… and that just wouldn’t do. She gathered up Doily just as he was sneaking up on his third Moquot, and hopped away merrily, keeping to the shadows. She heard the back door slam as Madacargas raced outside. And so the chase begins! She though mischievously, and bolted into one of her homemade holes leading under the neighbor’s fence. She snickered with delight as the wind tugged at her material and her Lightmite buzzed along in her ear. She scurried through flower beds, tree patches, vegetable twigs and fruit trees, but fruits were the most plentiful. After all, this was Fruity Path. Her nose twitched as delicate aromas wafted up her nostrils, but she knew she could not stop yet. Oh no, her main goal was get to the Algonquin’s and break their terracotta pots that littered their concrete patio. They contained all sorts of different plants, some of which were rare and must have cost a fortune. But that was the fun of it. Finally, as she flew over the last thorny bush, she was in the Algonquin territory. She looked around, scanning the premises for any sign of the terrible Bleeble. Bleeble was a fire Lupe, and he was truly something to be scared of. His white teeth glinted like ivory, sharp as razor blades, but much more deadly. He was the “guard dog” of the garden, and Epiffany had run into his jaws once… she did not want to do it again. The little pot fell to the ground and shattered into a million pieces. Epiffany laughed joyfully and began rocketing off the other pots like a pinball, tipping them over with tremendous speed. It went on like this for minutes, the little Lightmite attending to the small pots, and the Eizzil doing the rest. Suddenly, once the whole patio was red with potting remains, a black-faced, sharp-eyes Lupe came tumbling around the corner of the twig house, howling ravenously. “Bleeble!” Epiffany and Doily cried harmoniously, and bolted off in the direction of the thorns. Bleeble was right behind them, snapping viciously at their heels, but they didn’t care. They laughed with all their might as they just escaped his vicious maw by flying back over the bushes, which he could not avoid. He collided with the prickly wall with a yelp of agony, and they heard him run away, squealing like a snicklebeast. Unfortunately, their happiness was short-lived. The Eizzil was pounced upon suddenly by a small orange bundle, and was wrestled tirelessly to the ground. Finally, Epiffany stopped squirming, and looked up into the face of her baby kougra, Madacargas. She could tell he had been crying, as he always did when she ran away. Doily beat upon his head with ferocity that was not expected from a Lightmite his size, and his buzzing was most stressed. Madacargas swatted him away and lifted Epiffany off the ground, hugging her into him tightly.